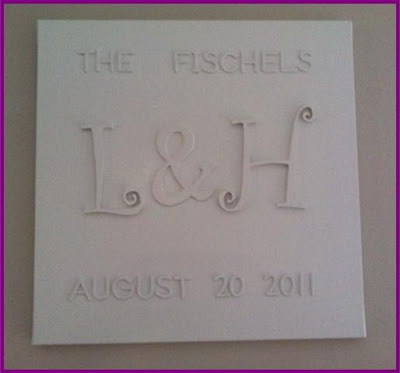 So here’s a super easy, super classy wedding gift that will cost you almost nothing. You can choose any wording you like. I chose to include the couples' last name, their initials, and the date of their wedding. You can follow my lead, or choose "wedding" sayings like I DO, IT ALL STARTED WITH A KISS, ALL BECAUSE TWO PEOPLE FELL IN LOVE, WITH THIS RING...you get the idea. Be as creative as you like! 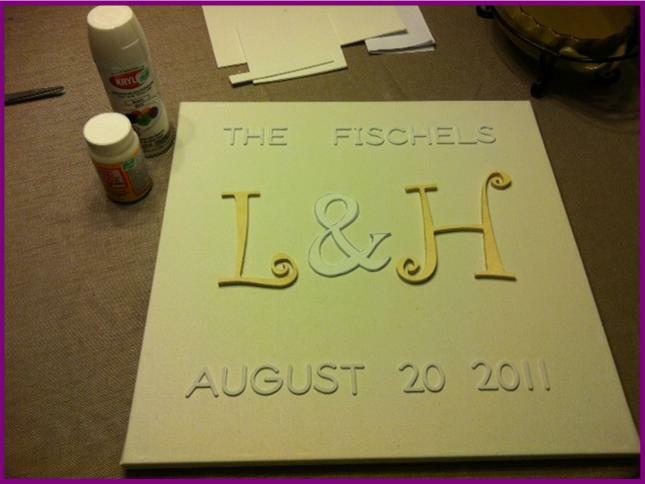 Arrange your letters on the canvas to get a feel for the proper spacing, then just secure them with your adhesive. Once everything is glued down, coat the entire project with a couple layers of white spray paint...and you're done! Awwwww...it's still hanging up in my living room and it's beautiful!! Thank you!! This is a wonderful idea and so creative, but simple! !